Privately placed catastrophe bond transactions, also known as cat bond lites, have grown both in terms of size and utilisation since their introduction to the market back in 2011, with almost $2 billion of new risk capital issued over the last two years being privately placed. This is according to data from the Artemis Deal Directory, which shows that in 2017, a record 28 cat bond lite deals came to market, bringing a combined $1.05 billion of risk capital to market, accounting for roughly 8% of yearly issuance. Following a record 2017 for the cat bond lite sector, in terms of total deal volume and the number of transactions issued, 2018 was close behind with total issuance of $902.5 million from 26 transactions, which represents roughly 7% of total 2018 catastrophe bond and related insurance-linked securities (ILS) issuance. The cat bond lite structure offers ILS investors with a lower-friction, more cost-effective and streamlined avenue for accessing catastrophe bond-backed reinsurance coverage, when compared with a traditional 144A placement. The increased sophistication and maturity of the ILS investor community has supported the growth of the cat bond lite sub-sector, with investors and sponsors both eager to expand the remit and improve the efficiency of the catastrophe bond and ILS marketplace. The first cat bond lite transaction, the $11.95 million Oak Leaf Re Ltd. (Series 2011-1), was sponsored by Southern Oak Insurance Company, structured using an indemnity trigger and which offered protection against U.S. hurricane risks. And while Southern Oak Insurance has returned to the market every year since 2011 with a new issuance under its Oak Leaf Re platform, more sponsors have entered the market year after year, bringing both trigger and peril diversification. A repeat of 2011, the only cat bond lite deal issued in 2012 was the $22.78 million Oak Leaf Re Ltd. (Series 2012-1) deal. However, from 2013 onwards issuance of cat bond lite, or privately placed deals increased, as shown by the Artemis Deal Directory, and the chart below which details cat bond lite issuance from 2011 to the end of 2018. In 2013, six cat bond lites deal came to market with a combined size of $234 million, which accounts for roughly 3% of annual issuance. The deals issued in the year covered a broader set of perils and regions, including New Madrid earthquake and severe thunderstorm, European windstorm, and U.S. named storm and hurricane risks. The following year, cat bond lite issuance jumped to $502 million from 16 transactions, accounting for approximately 5.5% of yearly issuance, and which offered protection against numerous perils, including Caribbean hurricane and earthquake, property cat risks, second event U.S. earthquakes and named storms, and more. 2015 witnessed the third highest level of cat bond lite issuance, in terms of total deal volume, in the market’s history, at $604 million from 17 transactions, and, which accounts for roughly 8% of yearly issuance. Peril diversification was again strong in 2015, while the size of deals also increased, most notably Market Re Ltd. (Series 2015-2), which offered $70.509 million of protection against Florida named storms. As peril diversification increased in the cat bond lite sector to include the likes of temperature risks, swiss property cat risks, European windstorm risks, Japan earthquake risks, and more, so did the size of deals. Individual cat bond lite issuances of more than $50 million and increasingly approaching the $100 million mark are more common in the space today than a few years back, further highlighting the increased comfort, acceptance and understanding of the cat bond lite structure by both the investor and sponsor base. The most notable year-on-year decline in cat bond lite issuance, according to data from the Artemis Deal Directory, came in 2016, when 13 deals brought $422 million of new risk capital to market, which accounts for 6% of annual issuance. But after this dip, and as noted earlier, 2017 cat bond lite issuance broke records and 2018 followed closely, coming in as the second most active year ever for the cat bond lite space, in terms of deal volume and the number of transactions issued. The private nature of these deals means that often little information is available, with sometimes little more being made aware to us than the name, issuer, and size of the deal. But where we do have the information, it is clear that since 2011 the peril diversification and size of the market has increased, as has the individual deal size. Artemis also tracks the trigger structure used by each deal, which, again is sometimes unavailable. 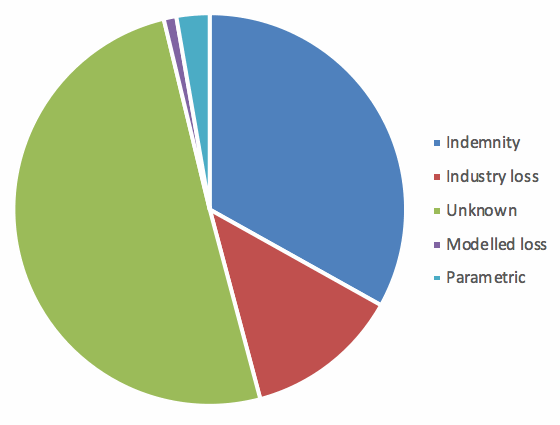 With this in mind, Artemis’ data shows that since 2011, approximately 31% of cat bond lite issuance has utilised an indemnity trigger structure, 12% an industry loss index trigger, 1% a modelled loss trigger, 3% a parametric trigger, with the remaining 53% failing to disclose trigger information. It’s important to remember that we don’t hear about every privately placed catastrophe bond that comes to market, so it might well be the case that the expanding sub-sector of the ILS space is even larger.